1 front Bumper nose part ONLY Plastic Model Car Part AMT 1:25 Mercury Bobcat Funny Car Drag Model Vtg. THESE are vtg vhtf 1:25 scale AMT Mercury Bobcat /Schlitz Malt Liquor Beer Pinto Funny Car Plastic Drag MODEL CAR Donor Parts ONLY. They are NOT for REAL Cars that you REALLY drive. They are 1:25 scale vtg old plastic amt MODEL CAR donor Parts ONLY. You are looking at 1 part only. 1-front Bumper nose part only. One white plastic Part only. You get 1 vtg amt drag car model part only. This 1 part only was a optional part to change the pinto car model in to a mercury bobcat funny car model. 1 plastic part only that came in the schlitz ford pinto funny car model. This is 1 vtg original part for the model. It was for for the mercury bobcat version and it was originally issued in the schlitz pinto funny car that it came from. 1 seperate Part only for 1 plastic model car only. You only get the 1 seperate white plastic part that you see. 1 part only for one amt drag racing funny car Only. You get the 1 part that you see in the 1st photo above only. If you do not see the part in the 1st photo above, then it is just not included in this listing. 1:25 scale donor plastic model car parts for 1 car model only. 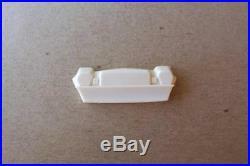 1 Plastic never used less then perfect donor part for one vtg 70's type/st yle funny car. If you do not see the part in the 1st photo shown above the description then it is just not included. Vtg amt issued tooling 1:25 Scale Plastic Model Car Pa rt Only. Molded in the color you see part, that came from a AMT funny car model car kit. These parts came from a vtgt amt vhtf Model Kit 1:25 Scale. If you do NOT see it in the pictures, it is NOT included in this listing. In G ood or better condition. The parts have NEVER been USED before. What you see in 1st picture at top of listing is what you get. The other pictures below are just multiple pic tures of same items in 1st picture. THESE are MODEL CAR Parts for 1 car ONLY. They are g ood or better never used but less then perfect condition by my grading standards, please see the pictures & grade to your standards. THESE are MODEL CAR Parts ONLY. Great item for any model car builder. And if you like this item please be sure to check my store for my future Model Car Parts listings. I do have 1000's of spare parts to list as time permits. The items in this listing are still in nice condition IMO by my standards, just not may be flawless perfect. Please see the multiple pictures of the item in this listing and grade to your standards. Please see pictures for condition and grade it to your standards. WHAT you see is WHAT you get. There is multiple pictures of the parts in the 1st picture. Please see pictures for condition. Discounted or Combined S&H is NOT available on any items. Please know that we are a smoker/pet friendly home. Most of my items are old collectible vintage items and they may or may not have odors. I cannot GUARANTEE that ALL items are FREE of any ALLERGENS you may be affected by? THESE are vtg AMT 1:25 scale plastic Drag MODEL CAR Donor Parts ONLY. They are NOT for real drag cars that you would really drive on a race track. The item "1 front Bumper nose part ONLY AMT 125 Mercury Bobcat Funny Car Drag Model Vtg" is in sale since Saturday, December 24, 2016. This item is in the category "Toys & Hobbies\Models & Kits\Automotive\Parts". The seller is "pj-toys" and is located in Ocala, Florida. This item can be shipped to United States.